Every organization and team is composed of members with different user roles. There are 6 user roles in Transifex, each with a different set of responsibilities and user permissions. Here's a look at them. The Project Maintainer role is tied to a specific project – not a team. However, Project Maintainers don't need to be added to the team that's translating the project they're managing since they already have translation permissions. We recommend making developers on your team either Maintainers or Admins. The Team Manager role is useful when working with translation agencies. Simply assign someone from the agency to be a Team Manager and they can then invite their translators to work on your projects and assign them different roles. If you're crowdsourcing translations, you can delegate some of the responsibility of managing a specific language to a trusted member of the community by promoting them from a translator or reviewer to language coordinator. 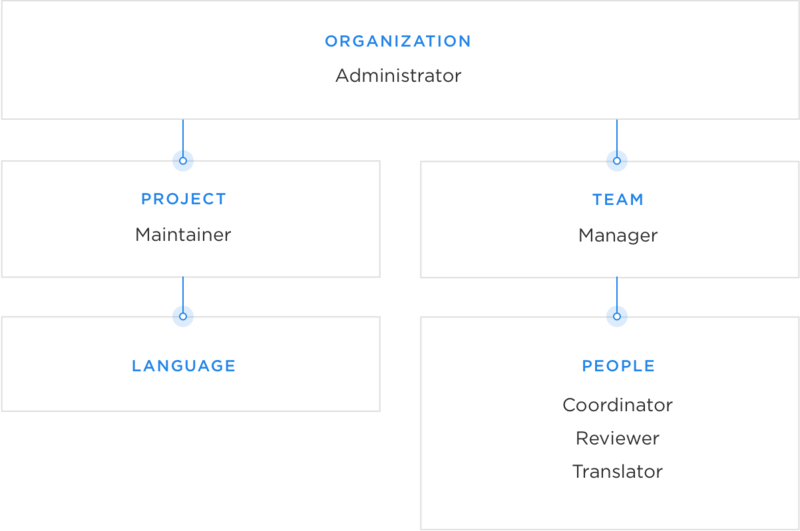 While there are 6 user roles in Transifex, only Team Managers, Coordinators, Reviewers, and Translators are part of teams. Admins and Maintainers work on an organization and project level, respectively.